In New Mexico, a developer may need to obtain a State Land Right-of-Way Easement from the New Mexico State Land Office (NMSLO) for projects that need access to, on, or over state lands. NMSLO administers the issuance of the State Land Right-of-Way Easement on or over state lands in New Mexico. The commissioner of the NMSLO (Commissioner) is empowered to administer ROW easements under N.M. Stat. Ann. section 19-7-57. For a basic overview of the right of the ROW process, see NMSLO Surface Division ROW FAQs. 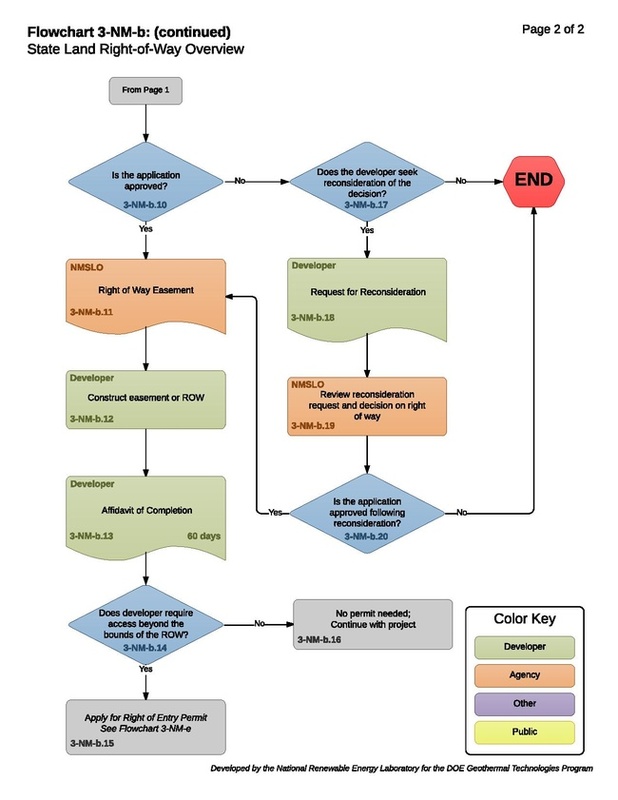 Developers should note that in addition to the specific permission process for conducting certain pre-application assessments (such as surveying) described in this flowchart and narrative, a valid Right of Entry Permit may also allow for certain pre-application assessments. 19.2.10.17 NMAC. Prior to applying for a ROW easement, developers are responsible for reviewing NMSLO records to determine which rights, if any, have been conveyed to or contracted for by third parties, which would limit or prohibit the Commissioner’s issuance of additional interests. 19.2.10.10 NMAC. 3-NM-b.2 to 3-NM-b.6 – Does the Commissioner Waive the Surveying Requirement? Developers seeking a ROW easement are required to survey the proposed land in accordance with N.M. Admin. Code section 19.2.10.12, unless the Commissioner waives the survey requirement. Even if waived, the developer must provide the Commissioner with a plat encompassing a detailed legal description of the proposed land as outlined in N.M. Admin. Code section 19.2.10.12.B. If the survey requirement is not waived, a developer must gain survey permission from the Commissioner prior to entry for surveying activities. The written notice of intent to conduct a survey of land subject to proposed ROW may be in letter form and should describe the purpose and general location of the land. 19.2.10.11 NMAC. The Commissioner may choose to deny the survey request, approve as is, or approve with added conditions. A denial of the survey request ends the ROW easement process. If accepted, the developer may direct a professional surveyor (as defined in N.M. Admin. Code section 19.2.10.12.A) to survey the plat(s). A waiver of property damage bond by the surface lessee coupled with a request that the Commissioner waive the bond requirement. 19.2.10.18 NMAC. In addition, the application must contain a legal description of the land to be burdened by the proposed ROW, together with the survey plat (unless waived) described in 3-NM-b.2 to 3-NM-b.6. 19.2.10.13 NMAC. Upon receipt of the application, the NMSLO will review the application materials for completeness. Applicants submitting incomplete applications will receive written notice of incompleteness and are allowed a reasonable amount of time to cure the deficiency. If an application is complete, the Commissioner will determine whether or not to issue the proposed ROW easement. 3-NM-b.10 - Is the Application Approved? The Commission may approve or deny an application for a state right of way easement. The Commissioner will issue a Right of Way Easement if doing so is in the best interests of the state trust lands. The Commissioner may attach conditions to issuance of the ROW, including consideration amounts other than the amounts outlined in the applicable price schedule. 19.2.10.15 NMAC. The Commissioner may terminate the ROW easement in whole or part if the developer fails to comply with any term or condition of the grant or any applicable law or regulation. In such a case, the Commissioner will give the developer written notice that the ROW is subject to termination and allow the developer 30 days to cure the problem. 19.2.10.26 NMAC. Upon issuance of a ROW easement, the developer may begin construction on the lands subject to the ROW in accordance with the terms and conditions of the grant by the Commissioner. Upon completion of construction of the ROW easement, the developer must, within 60 days after completion of construction, file with the Commissioner a NMSLO Affidavit of Completion of ROW Construction. If the developer fails to file the affidavit within 60 days, the ROW Easement is subject to termination by the Commissioner. 19.2.10.21 NMAC. 3-NM-b.14 to 3-NM-b.16 – Does Developer Require Access Beyond the Bounds of the ROW? 3-NM-b.17 – Does the Developer Seek Reconsideration of the Decision? The developer may request reconsideration by NMSLO of the denial of an application for a right of way easement. NMAC 19.2.10.30. The developer must submit a written Request for Reconsideration to NMSLO. The request must describe the decision for which reconsideration is requested, state the grounds for reconsideration and the relief sought, and be submitted to NMSLO within 15 days after the date of the decision for which reconsideration is requested. NMAC 19.2.10.30. NMSLO will review the reconsideration request to determine whether a right of way easement should be issued. NMAC 19.2.10.30. 3-NM-b.20 – Is the Application Approved Following Reconsideration? NMSLO may approve or deny an application after review. 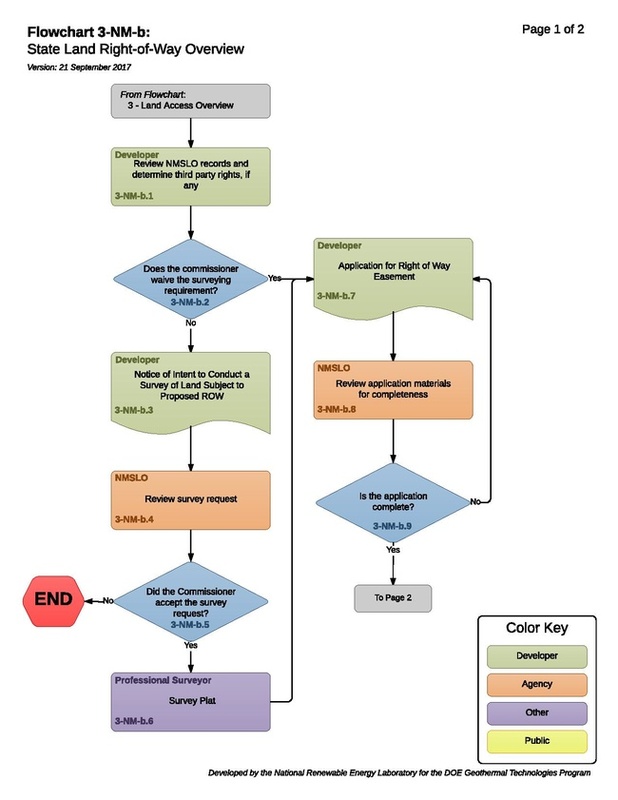 If the application is approved following reconsideration, then the developer should follow the procedures outlined in 3-NM-b.11 through 3-NM-b.16. This page was last modified on 13 November 2017, at 14:59.